Donald Trump's rise to power has seen a normalising of fascist and neo-Nazi beliefs. We should all be concerned: The Trump Presidency will probably fail, but the movement he represents will not have so far to go next time for the full flowering of fascism to succeed. 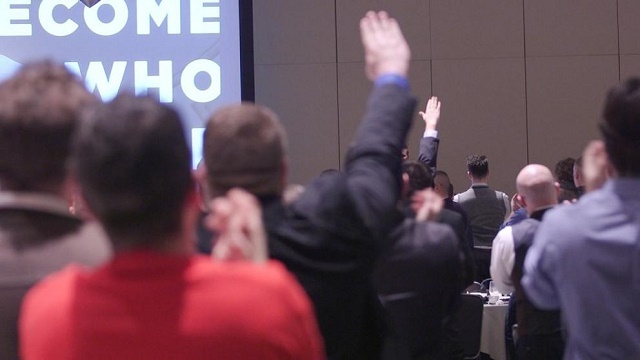 Trump supporters giving nazi salutes at a rally last week. People have had a lot of fun with Donald Trump. We mocked his pudgy little fingers and his wigs woven from the finest strands of gold. We’ve ridiculed his inability to string a sentence together and his belief that the presence of snow is categorical evidence that there is no such thing as global warming; but this has generally been a defence mechanism, a psychological response to something we know is truly dreadful. It is in keeping with what we call the “gallows” or “trench” humour that is used on those occasions when, staring into the abyss, jokes and hysterical laughter seem to be the best option. On social media we are still trying to keep our spirits up by trading in such levity. Trump has been given lots of names; “Mango Mussolini” and “Shitler” are perhaps the best. They allow us to feel superior to him while also giving voice to our fear. We know, but still can’t quite believe it, that Trump’s rise to power signifies the approach of a new fascist age. Our sense of dread and anxiety is heightened by the fact that when we speak of fascism we are aware it conjures visions of jackboots, storm troopers and concentration camps. Those who dismiss such fears can easily point to the fact that these things have not suddenly appeared in the US, so concerns are exaggerated, overblown or even delusional; Trump may have run a racist, misogynistic, divisive campaign—the literal meaning of fascio is the splitting into groups—and he may be filling his cabinet with white supremacists, but let’s see what he does, we say. It could be fine, we say. But we know the rise of fascism doesn’t start with camps. It starts in small acts of discrimination and bigotry made legitimate by a charismatic leader. Fascism has not yet arrived in the US, but unless there is a radical change in course Trump will be the herald of something very dark. Trump already has his foot soldiers: a bunch of tin-pot Nazis who call themselves the “Alt-Right”, and are precious about others using that term, too, because calling them Nazis hurts their feelings. These are the sort of people who sprinkle testosterone on their Cap’n Crunch in the morning. They are so filled with visions of alpha-masculinity that anyone who doesn’t violently affirm the wonders of whiteness is referred to as a “cuck”—a diminutive of cuckold, or a man whose been cheated on by his wife. As with earlier fascist movements, everything about this movement is based on white strength and virility. It is often referred to as white nationalism, but at its most cosmopolitan it also advocates for the protection of white European culture, which also translates into white Christian supremacy. But isn’t it odd that these hateful advocates of an imagined Teutonic purity and disciples of a billionaire identify with a religion started in Palestine by a Jewish refugee who believed in the primacy of love and the moral superiority of the poor, and which, when it migrated West, gradually displaced the “native” religion of Europe that was a nature-worshipping polytheism? The question remains, though, if they are so supreme, if their whiteness makes them so inherently better, stronger and more worthy, how come they moan and complain all the time about their identity being downtrodden, threatened and abused? The cult of virility is clearly an idealized projection of their emasculation. The language of the “cuck”, the epithet they attach to everything they don’t like, is a symptom that they all feel socially “cucked”. They are the “cucks” and they don’t want to be. They want a safe space where they don’t have to feel like that. They don’t want their privilege being called out and their sense of entitlement being challenged. They want it back, undisturbed and untarnished. To do this they want to roll back the social advancements and political victories made in the name of other identities based on race, ethnicity, gender, sexuality, and disability, and one thing we can be sure of is that a Trump presidency will do everything it can to bring this about and appease the devotees while he rakes in the cash. In truth, I have no sympathy for the feelings of white people claiming to be underdogs in what is clearly still a white supremacist society (Native-Americans brutalized resisting a pipeline white people didn’t want, African-Americans being summarily executed on the street for being black), but what I do have sympathy for are the millions of Trump supporters who aren’t supremacists, and probably aren’t even explicit racists, but are part of a demographic that has been left behind or forgotten by the forces of global capitalism. In this, the success of both the Trump and the “Brexit” campaigns are disturbingly similar. Both were run on a platform of racism and xenophobia, hoping to trigger everyone’s inner Nazi, but they also targeted the establishment imagined as the “bureaucrats in Brussels” by Nigel Farage and the lobbyists in “the swamp” by Donald Trump. Here, these two very wealthy men, Farage and Trump, set themselves up as defenders of working people whose livelihoods seem ever more precarious. However, rather than genuinely challenge economic inequality, they channeled feelings of resentment towards migrants, refugees and foreigners. In the UK, the resentment was the direct result of the politics of austerity ushered in by the Conservative government after the Financial Crisis of 2008. This policy has no place in mainstream economics. It is a political ideology in which the collapse of the economy was taken as an opportunity to dismantle the welfare state and public services that successive Conservative governments have sought to destroy since Margaret Thatcher began the neoliberal revolution in 1979, and of which Nigel Farage remains a staunch advocate. The experience in the US is slightly different, but the pressure on working men and women there has also been a result of socio-economic changes brought about by globalization and the off-shoring of jobs, the de-industrialisation and financialisation of the economy, and the consequent stagnation in wages. In the US, both Republicans and Democrats are supporters of this process, differentiating themselves only in the depth of the channels they will dig for trickle-down economics to work (it never does, by the way), and the commitment (or not) they give to “diversity”. Trump broke the mould here, as did Bernie Sanders, but Sanders was the only one clearly articulating a meaningful alternative. While Trump talked of economic change he had little in the way of policy, so, just like Farage, he had to rely on the dog whistle of racism. The difficulty for the left is that it has to articulate a long-term plan of improvement that requires belief and stamina to achieve. The left has to call on disempowered people to take a risk on something that will turn out better over time, but asking disempowered people to take a risk is difficult. On the political right, which has always privileged exclusionary politics, the turn to racism and xenophobia has an immediate effect. Compare the risk required to believe in something that will take time to build and which in turn might be based on principles of positivity towards others—another profound site of risk—with the immediate sense of empowerment that can be achieved through bigotry and hate. Where love is self-limiting, because you depend on another person to return it, hate is self-expanding and without this limitation. The strength of the political right, especially the fascist version that Trump appeals to is a very attractive position for precisely this reason. As Freud said about the Roman plebian, it doesn’t matter how poor or lowly the plebian might be, at least they are Roman and can kick down on the non-Roman. It has been the principle to maintaining power for millennia. As Juvenal told us, Government 101 starts with bread and circuses, and you populate the circuses with foreigners and slaves. The circuses were a distraction, much in the way our endlessly cycling and circling media of today acts as a distraction, but the circuses were also places where those at the bottom—those otherwise abused and marginalized—could feel strong and superior for a time as they watched the death of a foreigner. This is the logic of Trump — and of Farage. We already know that Trump’s cabinet is full to the brim with the lobbyists he claimed to oppose, and we know that his tax policy will massively benefit those at the top. We also know that he will be running the presidency as a kleptocracy in which America’s highest office is used as a marketing tool for brand Trump. We also know that the trade agreements will return. They may be marginally better for America, perhaps, and by that I mean the corporate plutocrats that will continue to govern, but they will largely be the same. Even the TPPA acronym could still be retained, but this time it will be the Trump Pacific Partnership Agreement, and like everything else he owns it will be painted gold. In effect this is an internecine struggle amongst the oligarchs. The truth of this was rather paradoxically presented to us by Steve Bannon—Lord of Post-Truth, founder of the “Alt-Right” media outlet Breitbart, and now Chief Strategist in the White House—when he described himself as “Thomas Cromwell in the house of the Tudors”. What Bannon sees as his job is the equivalent of helping a monarch wrest power and wealth from a pontiff. This is not about democracy and has absolutely nothing to do with popular grievances. While I am worried about what will happen in the next four years, especially to women and non-white Americans, I am more concerned for what will happen in the second term and after that. Trump will fail. He may not fail catastrophically in the first four years, but he will fail to improve the lives of working Americans in any substantial sense. On the back of those failures—and as the true cause of all our problems, namely an unaccountable corporate-financial aristocracy and their political aides continue to syphon off more and more money from the common wealth—the successful diversionary tactics of racism and xenophobia will have to be ratcheted up to secure re-election. The next iteration will not have so far to go for the full flowering of fascism to succeed. We are already seeing the normalizing of fascist and neo-Nazi beliefs by accepting the warm and cuddly, PC name of “Alt-Right”. We also seem relatively unconcerned by a White House full of white nationalist and weapons-grade lunatics. We are scared to call it out for what it is, because what it is is too frightening for us to contemplate. We all seem to be living inside Max Frisch’s play Biedermann und die Brandstifter (Bierdermann and the arsonists), in which the two lodgers that Biedrmann has staying in his house start taking barrels of oil upstairs. When Biedermann asks them what they are doing they say they are going to burn the house down. Biedermann laughs because he cannot entertain such a thing and thinks it is a joke, so they go ahead and burn his house down. So, this is the situation, if we do not articulate a radical alternative that will truly deal with the deep structural problems of the global economy our house will be burned down too. It will be seen that, as used, the word ‘Fascism’ is almost entirely meaningless. In conversation, of course, it is used even more wildly than in print. I have heard it applied to farmers, shopkeepers, Social Credit, corporal punishment, fox-hunting, bull-fighting, the 1922 Committee, the 1941 Committee, Kipling, Gandhi, Chiang Kai-Shek, homosexuality, Priestley’s broadcasts, Youth Hostels, astrology, women, dogs and I do not know what else….lmost any English person would accept ‘bully’ as a synonym for ‘Fascist’. That is about as near to a definition as this much-abused word has come.